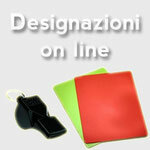 Giudice Sportivo - Official Web Site! NEL REFERTO DI GARA I NOMI DEI CALCIATORI RIPORTATI NEL RIQUADRO PROVVEDIMENTI DISCIPLINARI E SOSTITUZIONI DEVONO ESSERE SCRITTI PER ESTESO ( ES. ROSSI MARIO ) E LA VELINA DA CONSEGNARE ALLE SOCIETA' A FINE GARA NON DEVE AVERE INCONGRUENZE CON QUANTO RIPORTATO NEL REFERTO DI GARA.